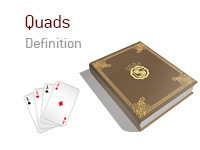 What are "quads" in the game of poker? What is the definition of the term "Quads"? "Quads" simply means four of a kind. Let's give you a couple of examples here to illustrate the usage of the term. You are dealt Ad-Ah on the button in a MTT. Action is folded to you. You raise, the small blind folds and the big blind calls. The flop comes Ac-As-6s, giving you Quads. The action goes Check-Bet-Call all the way to the river. The big blind turns over a small pocket pair, while you flip over your Aces. "Quad Aces" you say as you scoop the pot. You are in the big blind. Action folds around to the button, who puts in a standard pre-flop raise. The small blind folds. You look down at Ks-Qd and call. The flop comes Kh-Kd-Kc, giving you Quad Kings. You check, the button bets, you raise, the button re-raises, you push and the button snap calls. The button turns over pocket Aces, while you turn over your Ks-Qd. "Quads", you say. The board runs out 6d-6c, and you scoop the large pot. 3. Four of a Kind, or "quads". Let's give you an example of a hand where Quads would actually lose. The board reads Ac-Ad-Kd-Qd-Jd. You hold As-As, while your opponent holds 10d-8c. In this case, your Quad Aces would be beaten by your opponent's royal flush.